Like most life summaries, this Marv Johnson biography is a linear, birth-to-death account and, by merely existing, deems its subject worth remembering. Although few today would utter the R&B singer's name in the same breath as other Motown stars, his early success helped take the company forward as an R&B and pop-soul force. A mere 20 years after his birth on October 15, 1938, Marvin Earl Johnson had already sung with Detroit's Junior Serenaders at public events, played piano, and incorporated a gospel and bluesy jazz background into both. By 1958, he was ready to record "My Baby-O" and "Once Upon a Time" and bounce back from their failure when songwriter Berry Gordy offered to produce his music. With that, Marv Johnson joined the then-regional Tamla label and became Motown's first company artist. His own composition, "Come to Me," impressed Gordy and partner Raynoma Liles so much that it became Tamla's first record. If that was exciting, then its national release through United Artists--plus Top 10 and 30 spots for R&B and pop--must have been utterly exhilarating! And so, Motown was on its way. As was Marv Johnson, to United Artists, and into greater soul music circles that included Jackie Wilson and Sam Cooke. Yet he remained a Motown ally, both as a performer on its tours and producer-manager Berry Gordy's responsibility. In fact, Johnson's early tracks featured the heavy-beat, well-defined vocals that were fast becoming Motown specialties. If United Artists had spread out such hits over years instead of months, then Marv Johnson might have gotten more fans with stronger, longer-term memories. As it was, the streak above ended by 1961, two or three years before Motown got really huge and its artists got pop music historians panting. 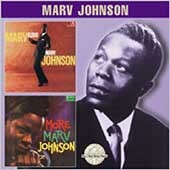 For the second time in this Marv Johnson biography, the soul singer joined Motown in 1965 after United Artists let him go. It was apt that he issued one song called, "I Miss You Baby." That single did okay. More significantly, 1966's "I'll Pick a Rose for My Rose" renewed his popularity in the U.K. in 1968. The end of that decade, however, also marked his last original recordings. Instead of giving up on Motown altogether, Johnson refreshed his relationship to it by working in sales. Despite his loyalty, that community disregarded his musical contributions in 1983's Motown 25 special. Another dismissal by old supporters. Fortunately, he wasn't quite history. After lying dormant into the late 1980s, the performance bug bit him once more. He sang live on Motown oldies tours, and under producer Ian Levine's guidance, re-cut tracks from his and other artists' repertoires. He kept going until May 16, 1993. A stroke during a Columbia, South Carolina show gave him no further chances to remind audiences of his talents. As I conclude this Marv Johnson biography, his influence as Motown's original R&B/pop star still barely registers on the public's radar screen. Maybe it's time to come full circle and hail his music--and legacy--once again. If this Marv Johnson biography kindles your Motown love, then come home for the rest of my artists!